2. Heat a large sauté pan to medium heat and melt butter. Add leeks and sauté for approximately 4 minutes. Add shrimp and scallops, season liberally with salt and pepper. Sauté shrimp and scallops for about 4 minutes. 3. Add alfredo and roasted red bell pepper pesto to sauté pan. Stir to combine and allow to heat through. Stir occasionally, will take about 2-3 minutes. 4. When pasta is done, drain over spinach in colander. (This will start to wilt the spinach). Allow to drain well, and then add pasta and spinach back to the pasta pot. Toss together to wilt remaining spinach. Add sauce mixture and toss to combine. Season with salt and pepper to taste. Thoughts: This dish is very simple to prepare and only has a few key ingredients that work beautifully together. 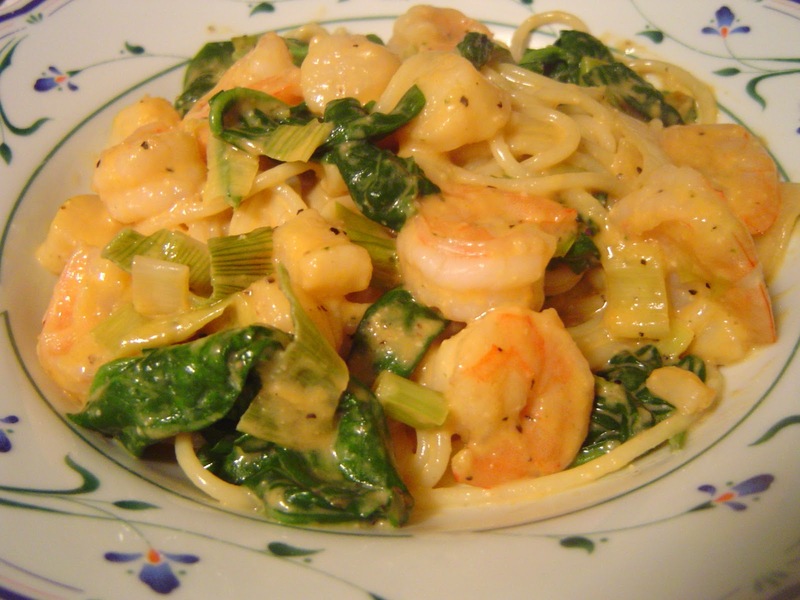 The sauce is not overwhelming to the seafood and the leeks and spinach add a nice balance to the flavors. The amount of sauce is just enough to coat the pasta without drowning the ingredients. Looks good! This is my favorite way to cook - whatever I have available and throw it all together! Thanks for coming by my blog- i cant wait to try some of your recipes!